We are delighted to announce that abstract submissions and registration for the 48th Annual Conference of the British Society of Gerontology in 2019 are now open. We look forward to welcoming you to Liverpool – an international city with unique attractions, and the home of the first Red Brick University. Liverpool is an old and culturally diverse city, with modern ambitions which reflect its prosperous history. Our Conference theme draws on these aspirations: Resilience and Living Well in Local Communities. Research into ageing is a priority for the University of Liverpool and is reflected in its multi-disciplinary approach into ageing from social gerontology, psychology, engineering, health research through to basic science. 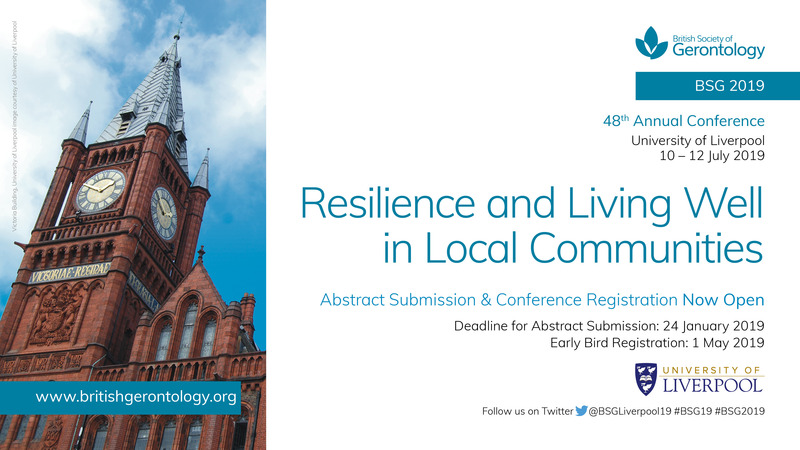 The conference will harness the skills of researchers, scholars, practitioners and older people to address the question: how can we all promote resilience for local people and our local communities? We look forward to receiving your abstracts and seeing you in 2019!